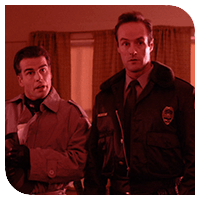 Cooper assists Bryson and Truman with setting up Ernie Niles to arrest Jean Renault and Mountie King at the Dead Dog Farm house. But the sting goes bad due to Niles nervousness in which a standoff ensues. Cooper then trades himself for Bryson and Niles and his held at gunpoint.